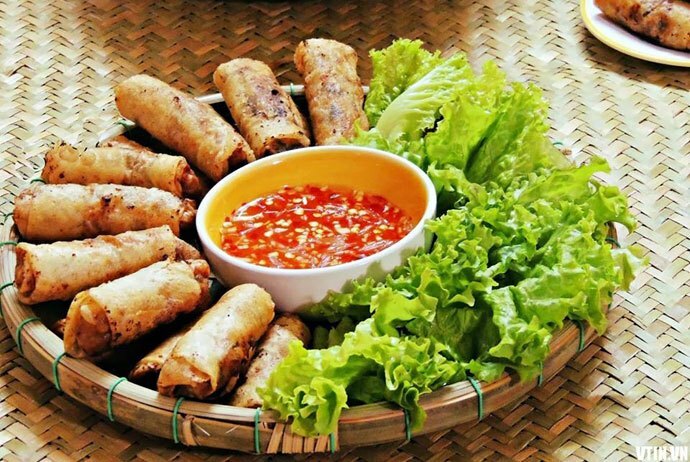 Fried spring roll is a simple-to-make dish, which has become a familiar dish to many families in Vietnam, especially on Tet holiday. 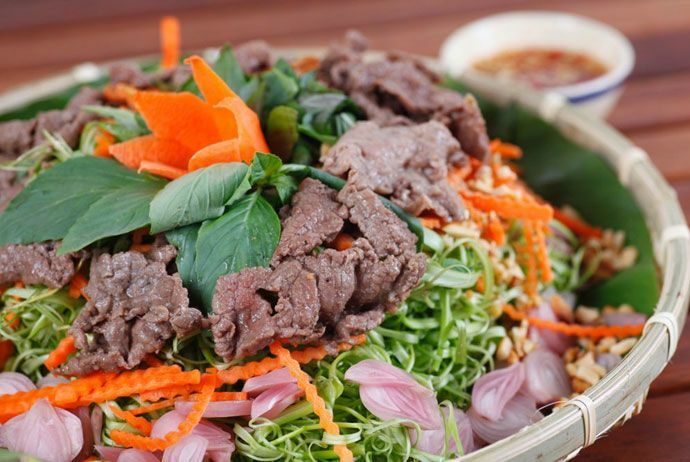 In fact, this is one of the most popular Vietnamese New Year food dishes which are enjoyed especially in the North region in Vietnam. The ingredients of spring roll include: chopped lean pork (most delicious are the soft lean meat), peeled shrimp or crab meat, mushrooms, wood ear, onions, bean sprouts (or pachyrrhizus), eggs, pepper, salt, spices … Mix them all and use rice papers (Southern people call it “Banh Trang”), which were soaked in water until becoming soft, to wrap the stuffing into the rolls and fry them until they become gold in a hot pan with cooking oil. The rice papers used to wrap spring rolls should be thin and tough because it will make the rolls more delicious and crispy without broken the shells. Dipping sauce for spring rolls should be carefully prepared in order to make the rolls more delicious. The sauce should be well-mixed with water, fish sauce, sugar, vinegar (if make the sauce with fresh coconut water, it will not need sugar any more), minced garlic, fresh chilli so that the sauce will get sufficient salinity, sweet, sour, spicy flavor and the aroma of garlic, chilli, and pepper. Besides the spring rolls, sausage, meat pie…which are prone to make people feel cloyed on the feast tray on Tet, it is indispensable to have a plate of sweet and sour grated salad. That is a special salad with many different variations: water spinach salad, banana flower salad, kohlrabi salad… but overall, they are very simple, easy to make and very popular on Vietnamese New Year holiday. The most delicious dried bamboo shoots are the pig tongue bamboo shoots – take the bamboo shoots out, split them, and dry them off. They look like pig’s tongues, thick, firm, and smooth without fiber. The dried bamboo shoots will be soaked in warm water, boiled, washed, and rubbed to get off the dirt, cut into slices when being served. Before cooking the dish, people can stir-fried the bamboo shoots with cooking oil, onions, and marinate them. 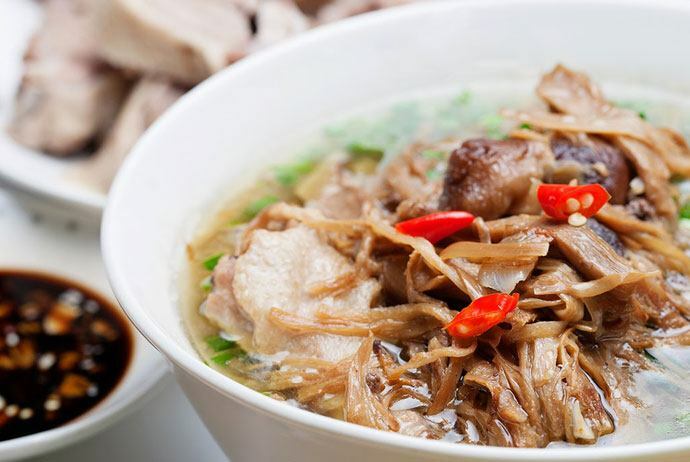 People can use chicken’s neck, wings, legs, or especially, pig’s leg, to simmer with bamboo shoots. The leg will be cut into small pieces in order to make it easier to eat. The pot will contain a pig’s leg layer and a dried bamboo shoot layer with some pieces of cinnamon and anise. Then, pour water into the pot so that water will cover the bamboo shoots and pig’s legs, and simmer it on moderate heat. People need to frequently skim the fat off the pot and add more water until the meat and the bamboo shoots become tender, add more spices, scallion, coriander, and pepper to increase the flavor. In this dish, pig’s leg and bamboo shoots interact in great harmony, and each ingredient is exalted in quality. The meat’s fat is reduced while still keeping the freshness and the deep, seductive aroma from herbs. The bamboo shoots will imbibe the fattiness and freshness of the meat, but still keep the natural savour of the forest.